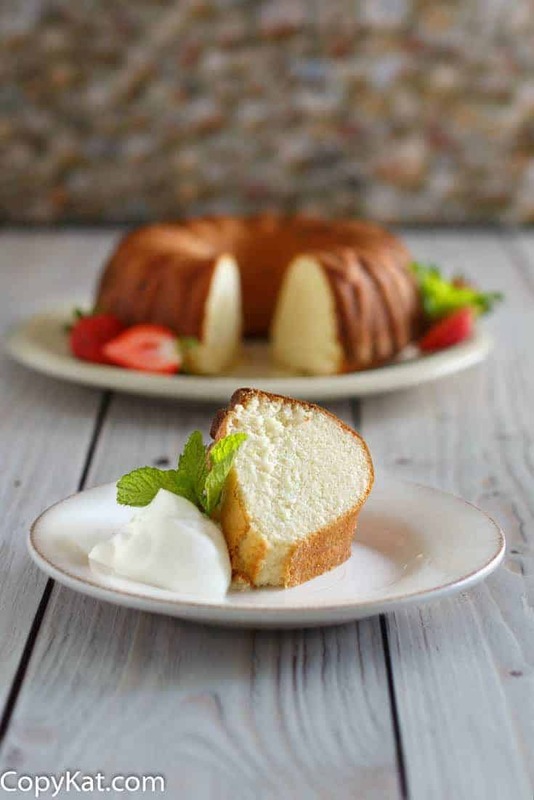 Scandinavian Almond Cake is a flavorful and easy cake to make. You can put this recipe together in no time, and I love this cake, it requires no frosting, it is perfect just out of the oven. I have to confess, this recipe isn’t mine, it isn’t mine by any stretch of the imagination. This recipe comes from the company cookbook that my workplace put out about 10 years ago. One of the ladies in the office would bring in this amazing cake every now and then. I literally asked for this recipe multiple times. It was always known as the perfect cake, one of my co-workers would bring it in, and it would disappear before lunch. One of my co-workers was kind enough to take a photo of the company cookbook for me. I brought this cake to my neighborhood Bunco group and it disappeared there. You know what I really love about this cake is that you can make it from scratch, and it is super easy to make. You can pop this out of the oven, and it is ready to serve. This makes a dense flavor-packed cake. It really doesn’t need anything additional, for me, that makes this Scandinavian Almond cake perfect. My biggest tip is to let the cake cool completely before you try to remove it from the pan. The cake is very moist, and it can break if you remove it too soon. 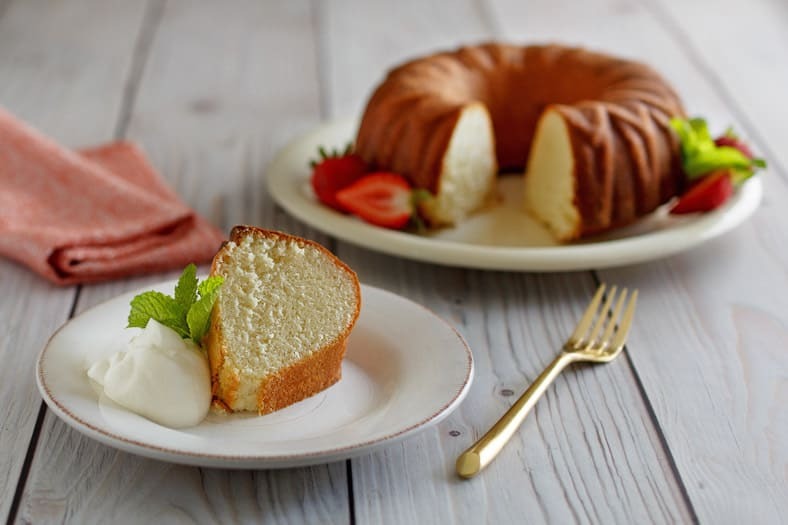 This cake has a rich buttery flavor. Preheat oven to 350 degrees.Generously spray a bundt pan with cooking spray or use vegetable shortening that dusted with flour. In a bowl beat the sugar and eggs together. Mix in flour, baking powder, milk, and almond extract. Add melted butter and mix well. Pour into bundt pan. Bake for 40 to 50 minutes. Edges should be golden brown when you remove this from the oven. Allow the cake to cool completely before you remove it from the pan. This makes a very moist cake, and it takes awhile before the cake will release out of the pan. You may want sprinkle powdered sugar on top or even serve this with sliced strawberries and whipped cream. I do not have an adjustment for this. I am so sorry. I grew up in Pueblo! Gorgeous cake Stephanie and almond is one of my all-time favorite cake flavors. The texture looks fantastic and the photos are lovely! 8 ounces half a pound ? Made this on Saturday in a bundt pan. It didn’t rise very much. I cooked it for 50 min. Let it cool all day and when I went to pop it out of the pan it didn’t budge. I cut it in the pan and it came out clean, however it did not cook all the way. There was a mushy butter area of the cake. The taste was great, but it is a very heavy cake! The butter amour seemed off (unless 8oz is no longer a cup!)…. My cake came out greasy in texture. The taste was good and it held together decently, but I’ll definitely try less butter next time so it’s not sooo greasy. I made this tonight and did not have a bundt cake pan so I used a loaf pan instead. It’s golden brown on top but it’s very jiggly and when I put a knife through it it did not come out clean. Does it need to go back into the oven? Your cake needed to go back in the oven. The changing it to a loaf pan changed the cooking time. Hi! Do you have a recommendation for a bundt pan? I love the one in your picture! I have changed the picture, but the old photo was a cake pan I bought marked down at Kroger. I thought it was an unusual pan. Thank you! Have made this cake twice and my family loved it! It has become my personal favorite! Cannot thank you enough! Will it work to bake it in a loaf pan or an angel-food cake pan? One of the best cakes I have ever made! Everyone loved it! Making it tonight for a party tomorrow! Serving it with fresh berries and whipped cream! If you make it, you will be a sensation at your next function! I know, this is a delicious cake. I seriously chased down a co-worker for years to get this recipe. I Added topped the cake frozen strawberries in their syrup from my grocer, and i made whip cream with powdered sugar and almond extract.andsprinkled almond slivers over all. There wasn’t a crumb left. Could you bake in a 9X13? This cake won’t raise very much, so if you do this, it will be a very flat cake. Just tried out this recipe today. LOVE it!!! !